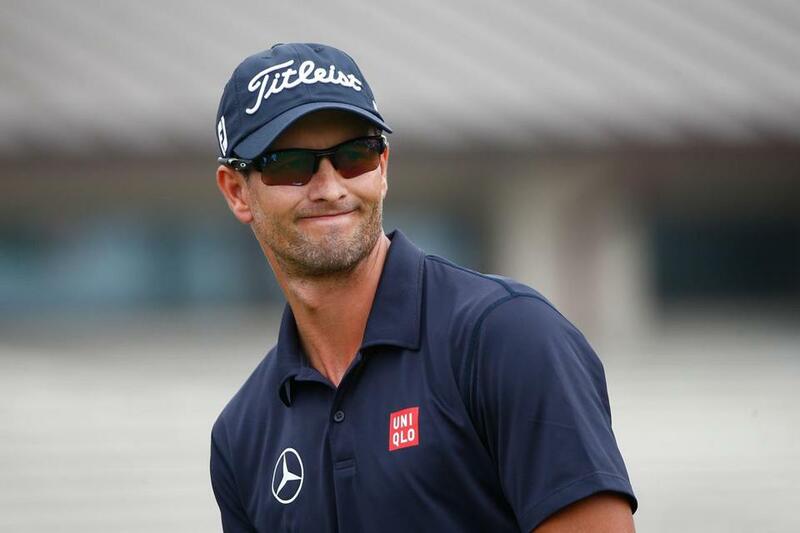 Defending champ Adam Scott wants to add a green jacket to his wardrobe. AUGUSTA, Ga. — Only one player in the 94-man field has a chance to win two majors in a row when the 78th Masters starts on Thursday at Augusta National Golf Club. That would be Jason Dufner, the reigning PGA champion. But only one person has had permission to take his green jacket off the Augusta National grounds the past 12 months, and Adam Scott is definitely not ready to forfeit that special winner’s privilege. In order to do that, Scott must become just the fourth person in Masters history to win the tournament in consecutive years. Jack Nicklaus (1965-66), Nick Faldo (1989-90), and Tiger Woods (2001-02) are the only repeat winners. It might seem, then, that the odds and the past will conspire against Scott’s quest this week. The only thing that got in his way on Monday was the weather. Heavy rain, which had been in the forecast, forced players and patrons off the course in the morning. The gates did not reopen to spectators. Back to Scott’s quest, though. He knows pressure far greater than trying to win the Masters for the second year in a row. He was living it exactly one year ago. No Australian had won the Masters from 1934, the tournament’s first year, through 2012, when Bubba Watson carved a wedge out of the woods and won in a playoff on the 10th hole. There had been multiple close calls for Aussies at Augusta, mainly involving Greg Norman, who was a national sporting hero and occasionally the world’s top-ranked player when blokes such as Scott were learning how to play. In 1996, when Norman suffered his cruelest Masters loss by frittering away a six-shot lead with one round to play, Scott was so distraught watching from home that the then-15-year-old couldn’t bring himself to attend school that day (because of the time difference, the Masters always concludes on Monday in Australia). Scott’s thoughts flashed to his homeland, then, when his birdie putt disappeared at Augusta National’s 10th hole last April under an early-evening drizzle. By beating Angel Cabrera in a playoff, Scott finally gave his country something it always wanted, felt it deserved, and had come so close to getting. Six months after he closed out Cabrera, Scott – who is now based in the Bahamas – returned home to Australia, with the jacket, playing in four professional tournaments, winning three, and being entirely swept up in the adulation that comes with accomplishing something that nobody before could ever do. “I was completely overwhelmed with the response,” Scott said. For the most part, Scott has followed the same schedule that’s allowed him to contend recently in major championships: In addition to last year’s Masters win, he has seven finishes of eighth or better in his past 12 majors. Scott’s secret? He’s scaled back the number of tournaments he’s played, in hopes of honing his game in time for the four majors. It’s a formula that’s seemed to work. He’s played in just five PGA Tour events in 2014, but has four finishes of 12th or better, and three of eighth or better. His best showing of the season, a third at the Arnold Palmer Invitational, came in his most recent start. A day later, on March 24, Scott popped in at Augusta National, his first time back since winning. He returned again on Friday, ready to begin the serious on-site prep for his defense. But not before two special treats. The first was playing Augusta National with his father, Phil. The second was taking part in a ceremony at the Drive, Chip, and Putt Championship. Scott, wearing his green jacket, handed out the trophies in the boys’ 10-11 division. It’s a scene he’s become familiar with the past year: Posing for pictures, shaking hands, signing autographs. Letting admirers get a close look at golf’s greatest garment. Come Thursday, he’ll be all business, chasing history and perhaps the world’s No. 1 ranking. With Tiger Woods not playing because of recent back surgery, Scott could claim the top spot by finishing third or better. He’s second in the rankings.